There are lots of options to bagging 'em! 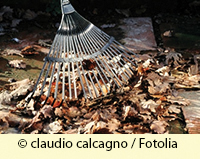 • Mow over leaves, using a mower bag to collect them. The resulting finely chopped leaves take up less space, break down more quickly, and are less flyaway and easier to handle than unchopped leaves. Chopped leaves also make a good mulch for perennials beds and borders to protect them from winter’s extremes. Gently pull or rake off in early spring. • Compost them. Leaves—especially chopped leaves—are a great addition to the compost pile. • Create a pit compost. If you have a good place for it, dig a big hole or trench and fill it with leaves. Spread the excavated soil over the top and surrounding area. Over time, the leaves will break down and you can add more—or simply fill in with more soil. • Create a temporary leaf pile. Use chicken wire, boards, or other handy materials to corral a big leave pile. By spring, the leaves will be broken down. • Dig them into your vegetable garden. By spring, they’ll break down and feed the soil.